July 10 2019. The house will only be available to family during this period. If you want to book the house for a holiday later in 2019/2020 please make your enquiry before or after the above dates. Thank you. 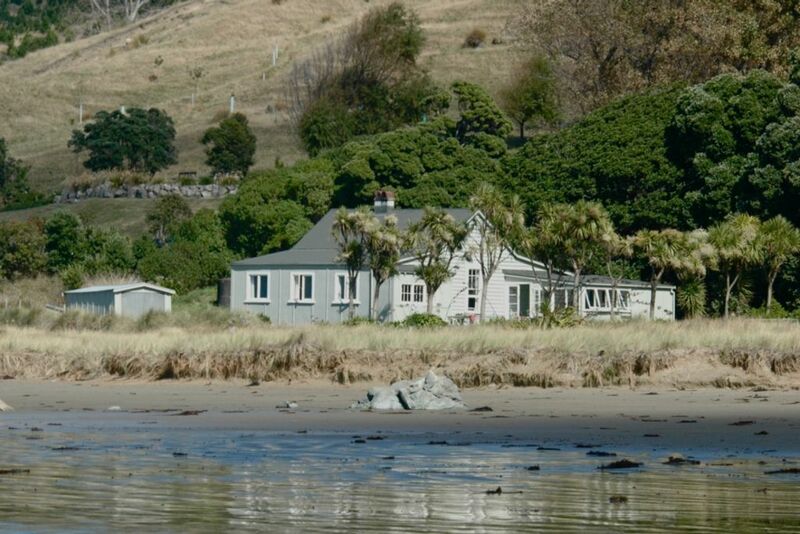 A very special historic holiday home right on beautiful Mangakuri Beach. Mangakuri is a holiday paradise for swimming, boogie boarding, fishing, surfcasting, boating, sunbathing, long beach walks and playing in the rock pools. "Waione" has been in the same family for over a century. It was converted into a holiday house from the original farm woolshed in the 1930s. There's a generous living room filled with historic photographs which has a big open fire; a roomy sun porch with great views out to sea and a large hall with a table tennis table. There's one bathroom with a bath and overhead shower and another hot shower outside. The property is ideal for family holidays - it can comfortably accommodate up to 8 people. The house has spacious decks front and back and a woodshed with a good supply of firewood. There are plenty of board games, cards and bach books. This is a much loved holiday home on a magical beach. Many families who book a holiday at "Waione" keep on coming back. Note: For weekend stays, the check out time is 4pm. For other short stays or off peak holidays, if no one else is coming into the house on the leaving day you may be able to stay later than midday the day you go - please discuss with owner. Pets may be allowed, by negotiation. Landline for general use.No coverage at the beach for cellphones. If you have the internet, many phones work for texting only. Panel or oil heaters available in all the bedrooms and the hall. Big open fireplace with plenty of wood. Wifi - rural service. For basic use such as emails and browsing. Not for movie downloads and video as we have limited gigs. $20 extra payment for use of internet. Basics such as sugar, flour, tea, salt and pepper, spices, are there and you are welcome to use these. Dining table in the porch and another one in the living room. Basic old fashioned things. Sky aerial - you need to bring you own decoder. Basic system. Tucked under white table in living room with the tv.You Can plug in your phone, iPad or iPod. Lots of bach books - wide selection. Please leave at the bach. We loved our stay. Mangakuri is such a lovely beach, and this bach is directly across from the water. It is a spacious well lived in and well loved bach with everything we needed to make us feel at home. A very charming place with style. We would have liked to stay longer. Great access to the beach, authentic bach with loads of room and top owners to deal with. Our favourite bach in NZ. Amazing house soo many good memories made!! !